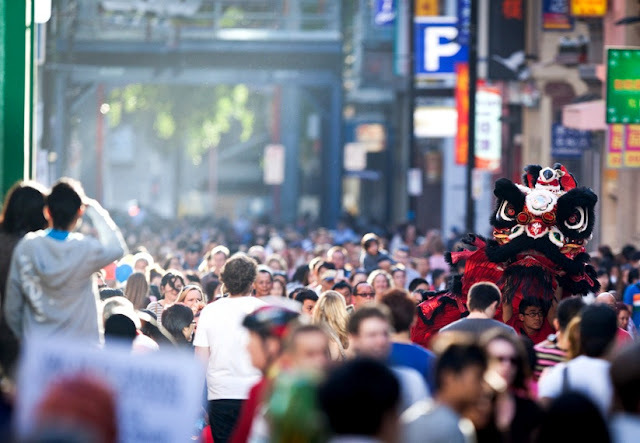 chinese new year, chinatown, melbourne, 2013. Following the lion... Chinese New Year celebrations in Chinatown, Melbourne. On Sunday the 10th of February, the first day of the Year of the Snake, I took the day off work, and skipped off to Chinatown with Simon to take in the Chinese New Year festivities. It was lots of fun. Crowded, yes, but with an air of camaraderie. For some it is a familiar event that reminds them of home; for others, the celebrations hold an exotic appeal. I left all the picture-taking to Simon while I enjoyed our walk through a veritable lagoon of people... the photos here I stole from him, though I did slightly crop and process them before uploading. Outsourcing to him was a great idea, even with the severe lack of food representation, as he captured gorgeous, atmospheric moments that I don't think I could've caught. 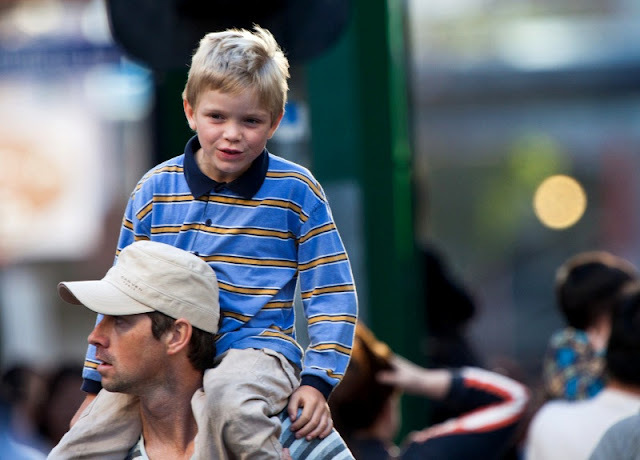 A boy enjoys the view atop his father's shoulders. I have fond memories of spending Chinese New Year in Malaysia with a crazy number of relatives. There is always a lot of eating, drinking, and yes, gambling with card games. Usually in that order, and late into the night. New clothes and shoes are bought and saved months in advance, and trotted out for the occasion. For us young'uns, outfits with pockets are favoured for their ability to safekeep money-filled red packets. For the two weeks, there will be an abundance of cakes, biscuits, nuts, seeds, and candies, and we would wander through them anytime we felt peckish. For beverages, there are soft drinks such as the delightful but questionably named Kickapoo, and the cardboard packets of chrysanthemum tea, sugarcane juice, soy milk, herbal tea, as well as the tinned longans, rambutans and lychees served with grass jelly and ice, and sometimes, jackfruit and pineapple, too. Let's also not forget the lovely and lightly alcoholic shandy, of which I would take the occasional naughty sip. On top of it all, there is the comfort of being with all these people I know; the raucousness, the good spirits. Playing with my sister and our cousins, the sort that requires nothing fancy other than a little imagination, and a lot of enthusiasm, like "The Eagle catches the Chicks". Going off to the shops together, to buy little treats with our red packet money. Sometimes even joining in with the adults for a round of Big Two or Blackjack, or teaming up with the other kids to form our own posse. Chinese New Year in Australia isn't quite the same, and I have doubts that it will ever measure up to my nostalgic childhood memories. We're all grown up, scattered across different countries, doing our own thing. And the food... oh how I miss the food. But life can be good, anywhere you end up. So I'll leave you here, with all these glorious, wistful reminiscences. 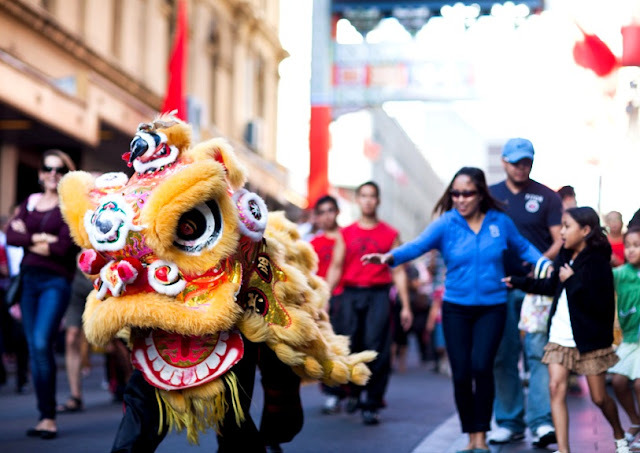 More lion dance goodness at Little Bourke Street, Chinatown, Melbourne, during the Chinese New Year festival. 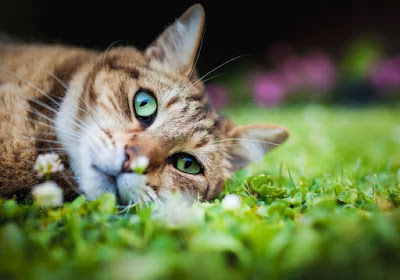 He is such a talented photographer! And I love reading your reminiscences. A lovely, thoughtful post. I understand you miss how it felt back home, of course it's not really the same but you can recreate your own CNY as you go. And yeah, ultimately, life is good. Happy Chinese New Year, Leaf! Ha, yes, there should be, indeed. Maybe I'll get around to that next year! I missed it this year but last year I went to the one in Houston. I loved it. I loved watching the faces of all of the asian families that are located here in Houston. Have a happy New Year to you! Thank you, Sarah. The atmosphere is so good at festive traditional events like this, isn't it? This is a lovely post, the joy of the crowds is infectious! We recently posted about Chinese New Year desserts that we have enjoyed for some time. Can you add anything to that that we might have missed out on? You definately captured the mood there :) Love the shots! What a beautiful post, that sounds like an absolutely wonderful time! 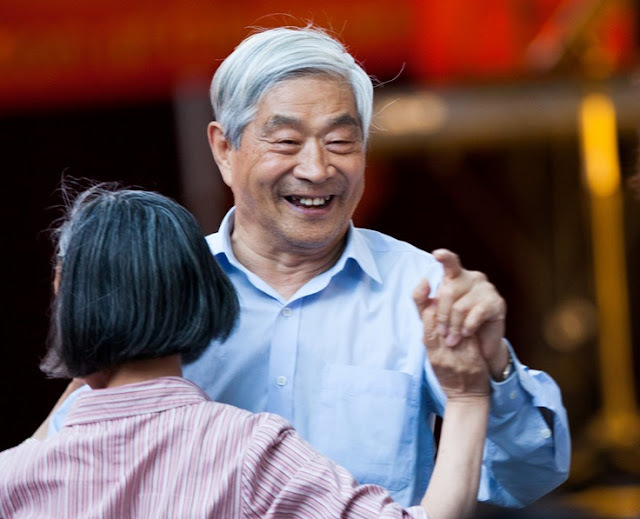 OMG I love love love that photo of that old couple dancing and laughing ~ I know what you mean by Chinese New Years in Melbourne just isn't the same as it is in Asia...I never use to like CNY much but now living in Melbourne by myself >_< I really do miss the time celebrating with family. The festiveness is so much more enhanced and all-encompassing in Asia, I agree! I think I took it for granted too, and treasure it so much more these days. Love how well this is celebrated in Melbourne. You really capture the spirit of the festivities and the joy of the people. Lovely photography. i don't know if the chinese community in hobart does anything like this - it certainly looks joyous! happy chinese new year to you. I think I've only done one CNY in Malaysia. One of my aunties took me around the village to see all these people I'm so called related to, received enough red packets to buy a nice watch haha! We have our own traditions here, and I've taken on pineapple tart duties which no one ever did! Excellent photos Simon! Loving the vibrant colors in those street shots. That picture of that dancing couple is beautiful! And you are right, CNY in Malaysia is really not the same as CNY here!